Hmmmm. Need a Plan B. [Thinking, clenching tiny paw] Think, Moose, think! BACK TO PLAN A!!!!!! GALLLLGH!!! Tiny hamster Moose and Michael L., MERCI! I can't beleive I ate the whooooooooole thing! We have achieved Trifecta, People! One of the best posts. EVAR! I love it! This reminds me of a video I saw once of a small owl feeding a whole mouse to a baby owl who was about the same size as the mouse. The baby eventually gagged down the whole thing, not having much choice once it started, but I couldn't see that there was room inside there for the mouse and the owl both. In both cases I think the parent figure needs to do some chopping. Eeeeeeeeeeeee! I love hamsters. That's just too cute! Makes me want grapes. This made me laugh :D The cute little hamster is barely bigger than his snack! that has to be one of the best posts evar. loved the captions! Wait - this hammie is scornful and jealous? 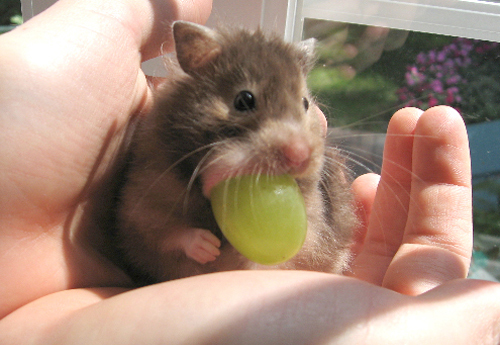 Doesn't look like it, but...devour grapes, right? ahhhhhh his little eyeball is stretched out in that last picture cuz all his extra skin, even lower eyelid is going to wrap around that grape! This is hands..er.. paws-down the funniest thing I've seen in weeks. I love in pic # 2 the spray of whiskers caught in the sunlight making an arc over the spectacle of the grape-stuffing! Moose sure knows how to handle big stuff! Awesomely cute! Am I weird for findng the teeny nostrils in picture #2 really cute? Yes, yes, the grape is funny, but please, members of the cute jury, I direct your attention to the teeny belleh in picture 2. That is the damn cutest ting I evah saw!!! My teeth hurt and I have an uncontrollable urge to laugh and throw things. Pic #2 especially makes me wheeze and sneeze milk out my nose. Someone's eyes are bigger than his cheek pouches. Fist Pic:"Oh no, not again! 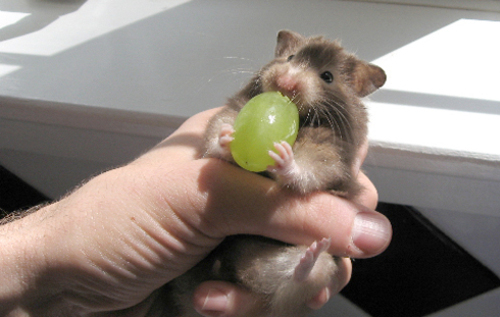 Everytime I want a grape, I have to fight you off!" 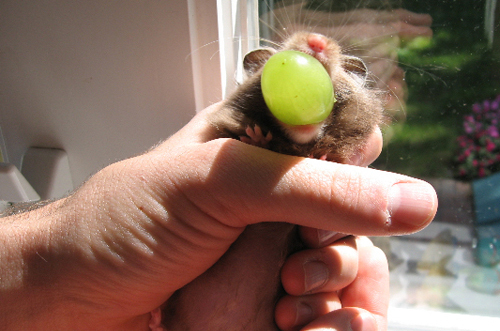 Second Pic:"Give me back my grape!" Third Pic:"Ok, you want it so bad, let me see you eat it!" Last Pic:"Nice try pal, now spit it out!" I wonder if a hamster could actually damage the cheek pouch if they tried to store something way too large or sharp. And then what happened...? Can't you just see that grape bustin' like a big water balloon? I had a really dim hamster once, who got a whole baby carrot in his cheek-pouches, sideways, and then got himself stuck in his climby-tube because he couldn't make the turn. I had to take the tube apart because he wouldn't spit out that yummy carrot! Is Moose teh coolest hamster name evar, or what? when i used to have hamsters they would take the food pellets (very rough round balls) and stuff themselves, and when they pulled them all out, there would always be little cheek bits stuck all over the food. of course, a grape is smooth, so he should be fine. but i think nature made it so they would be okay. I couldn't help wondering, though... how would he swallow said giant grape if the hand was holding him around his belly? That is A W E S O M E! This is one of the most hilarious sequences ever - right up there with "snail scattin'"! And a ham named Moose: w00t! Buahahaha! Gotta freaking love hamsters! My hamster does that with baby carrots! Oh, thank crikey CO is back. Hello everyone. I have been lurking for months but this little hammie has finally lured me out of lurkerdom. More hammies stuffing things in their moufs please. 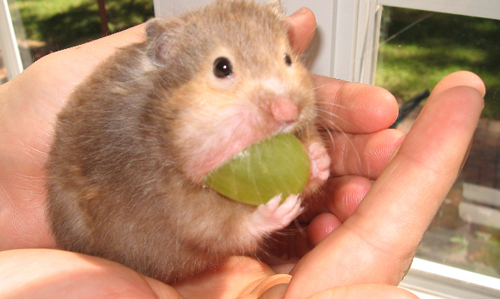 "Hammies should probably avoid eating grapes when they're on a date"
True. He's eating so voraciously, hardly paying attention to his surroundings, he'd probably fall off. I always loved when my little ones would do that. Awwww. I love hamsters.